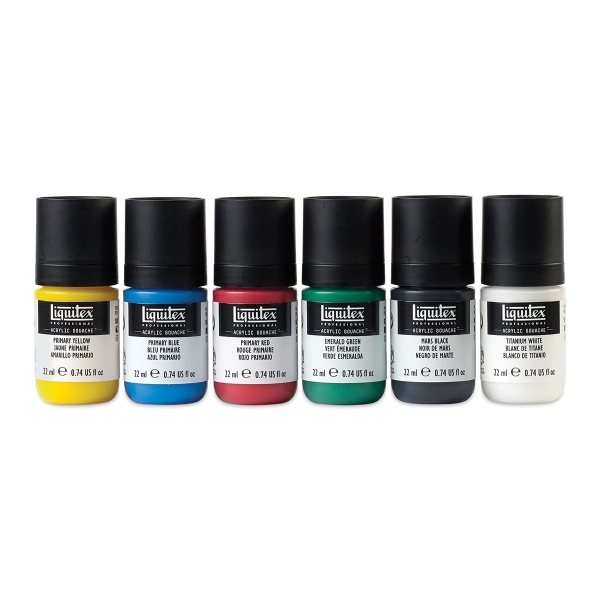 Liquitex Professional Acrylic Gouache combines the qualities of traditional gouache with the benefits of an acrylic. The archival-quality paint is perfect for mixed media works and alternate surfaces, as well as for color blocking, layering, illustration, and design. The colors are highly opaque, lightfast, and vibrant — they contain the highest concentration of pigment Liquitex has used. They're also water-resistant when dry. The colors dry quickly to a permanent, flat matte finish — no brush strokes, reflections, or cracks. Yet they have a creamy, fluid texture with no drag, so you don't have to add water for them to be workable, diluting color vibrancy in the process. Liquitex worked with artists to create new, ergonomic paint bottles for this line. They're reusable, recyclable, easy to squeeze, and don't have corners, so paint won't get trapped and go to waste. Artists can also stack them on top of each other! The bottles have screw-off tops and extra-wide necks for easy access to the paint. They also have tapered nozzles with a variety of cut marks. All colors are AP approved and safe for artists. ® Liquitex is a registered trademark.™ Professional Acrylic Gouache is a trademark.